Well-known Dublin based JP Ryan has chosen SDC Trailers bespoke design sloping skeletal trailers for its fleet renewal, with advanced features for durability, safety and operational efficiency. Continued investment has seen the logistics operator secure a solid share of the liquid and dry bulk logistics industry over the last 70 years, working with the largest global ISO Tank operators as both a supplier and a customer. The new sloping skeletal trailers were developed by the Toomebridge, County Antrim manufacturer in line with JP Ryan’s specific requirements to transport 20ft ISO tanks for liquid and dry bulk logistics. One key feature to note on the new design is the light weight, which offers greater payload and a reduction in CO2emissions. Automatic twistlocks allow for ease of operation and where health and safety requires, the driver can remain in the cab when locking the container in position. 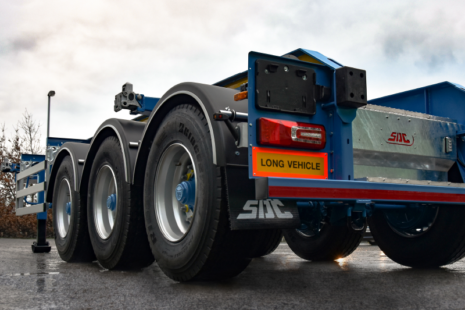 At the forefront of health and safety, SDC have developed a lower access walkway to the rear of the chassis with larger drip trays for containing spills while coupling / un-coupling pipes from the tanks. The drip tray walkway and supporting steel work is made from a combination of aluminium, stainless steel and galvanised steel for maximum corrosion resistance. The trailer also features the latest LED lights and ADR wiring. The manufacturer has been serving the road transport and logistics industry since 1978, with a broad portfolio of skeletal trailer designs including a 15.6m extended skeletal trailer which was recently developed for Scottish operator Malcolm logistics for use with their 50ft ‘big box’ containers. SDC offers new and used semi-trailer solutions for the retail, mining, manufacturing and construction sectors.